You're probably confused as to how I have a post with all kinds of snow and then days later have a post with mud... and grass... and then have a post with more snow... Well, welcome to Upper Michigan! This time of year can be super unpredictable with the weather. 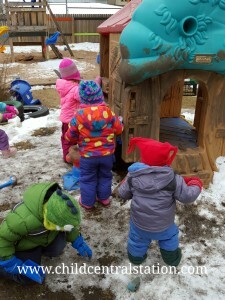 This year in particular we had an early thaw.. and much of the sandbox and grass has been showing! However.. that doesn't stop the snowflakes from falling! Each morning/day is a new surprise as we are uncertain what mother nature has in store! 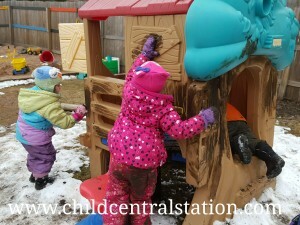 The other day, it was "warm" (in the mid to upper 40s Farenheit), with a chilly breeze, but we had a lovely patch of mud on the hill! 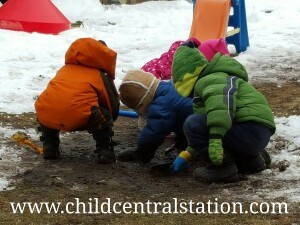 The children carried mud back and forth from the puddle to the house. Most of them using their mittens as paintbrushes... They worked to cover the house both inside and out with a a fresh coat of "paint." 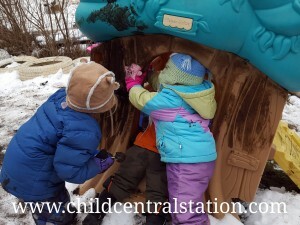 There was a lot of team work and cooperation happening. 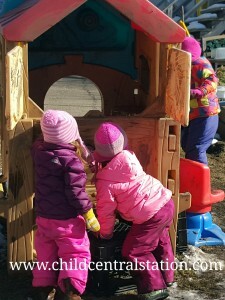 The house was just big enough for most of the children to have some space to work. 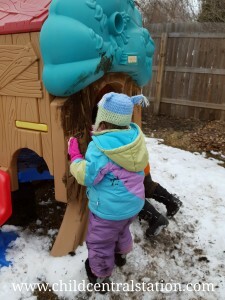 Almost all of the children opted to use their mittens/gloves as paint brushes, but for those who did not... they carried small scoops of mud over to the house and just dumped the mud right on the side and watched it ooze right on down :). The third day of painting was much warmer and sunnier again! The children continued on their mission of painting the house. 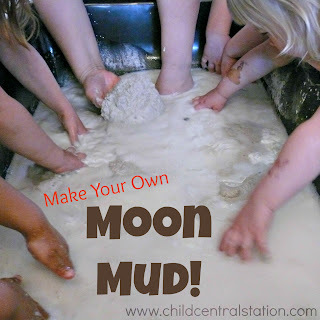 Have your children been painting with mud? 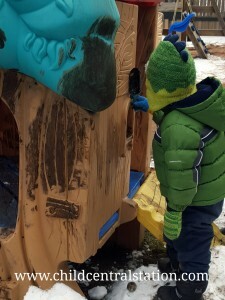 It was interesting to see that as soon as I posted a photo from one of the days on my Facebook page.. another provider shared a photo of a child who opted to paint with mud in her program the very same day! I'd love to hear about your mudpaint adventures!